Definition at line 25 of file MSP430TargetMachine.h. 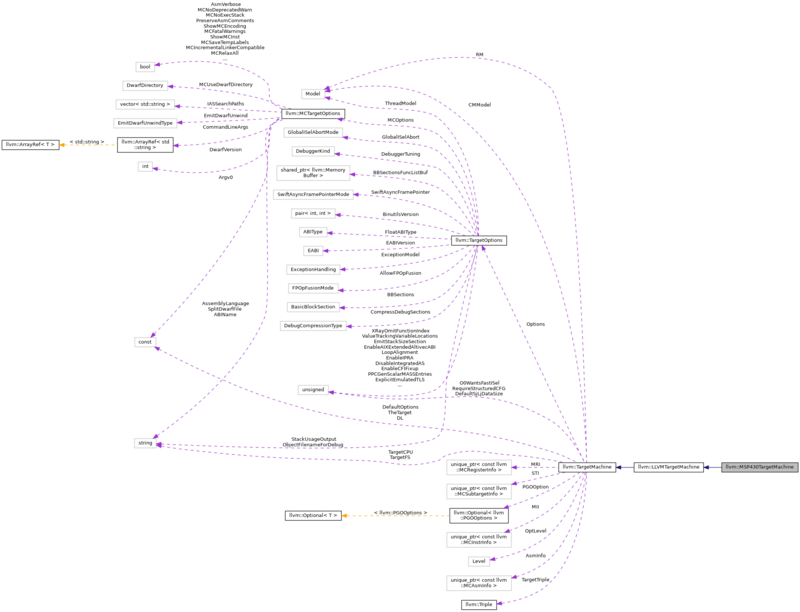 Definition at line 39 of file MSP430TargetMachine.cpp. Definition at line 53 of file MSP430TargetMachine.cpp. Create a pass configuration object to be used by addPassToEmitX methods for generating a pipeline of CodeGen passes. createPassConfig - Create a pass configuration object to be used by addPassToEmitX methods for generating a pipeline of CodeGen passes. Targets may override this to extend TargetPassConfig. Definition at line 71 of file MSP430TargetMachine.cpp. References llvm::createMSP430BranchSelectionPass(), llvm::createMSP430ISelDag(), and llvm::TargetMachine::getOptLevel(). Definition at line 41 of file MSP430TargetMachine.h. Virtual method implemented by subclasses that returns a reference to that target's TargetSubtargetInfo-derived member variable. 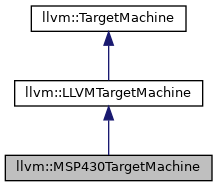 Definition at line 36 of file MSP430TargetMachine.h.